Time and timelessness, eternity and the present moment, all meet in the middle of the wilderness. Here is where tradition, materials, and a respect for minimalist aesthetics are at one with their environment. This exhibition is a unique experience which allows nature to openly connect with Finnish art and design. In the bosom of the quiet wilderness, you can now be a part of this magnificent connection. MARKKU SALO is a reputed Finnish designer of glass work, and carries on the important traditions of art’s Golden Age. Salo lives and works in Nuutajärvi, a village steeped in an over-200 year history of glasswork. Largely due to the work of Salo and his wife, Marja-Leena Salo, the village is seeing a great rebound towards being a major center for Finland’s glass industry once again, after a long period of uncertainty. Those who experience Markku Salo’s art are moved and enraptured, regardless of their nationality. His sublime work has mesmerised international collectors, galleries, and art museums. Markku Salo has built a long and successful career as a designer and has received numerous awards and accolades, most recently the prestigious Kaj Franck Design Prize 2015. Need we say more? 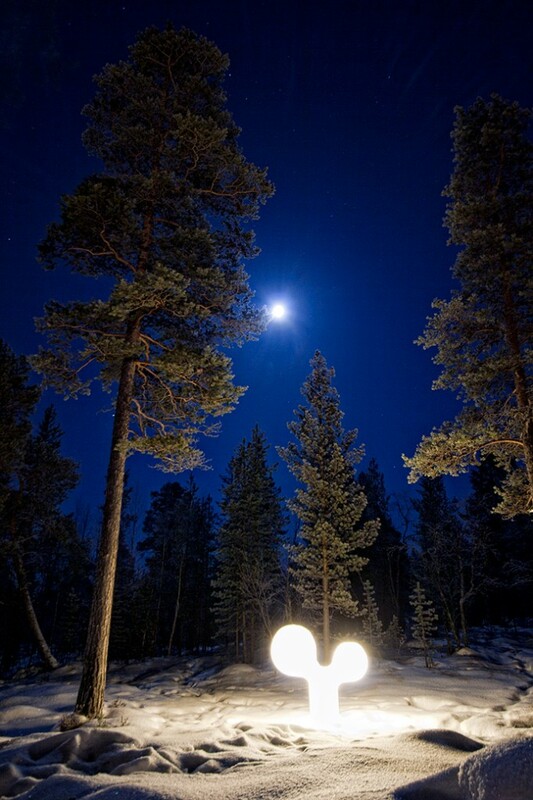 JUSSI NIVA, born in Lapland and based in Berlin, has received international attention and achieved great success as a visual artist. Currently exhibiting at the Helsinki Galerie Forsblom, his art may also be admired at the north IDOLI gallery. The visual dynamism of Niva’s work incites a dialogue of the polarity between sensitivity and power. The viewer is left with a feeling of undulation and questioning. To art historians, Niva’s expression proves to be an inexhaustible source for analyzation of the microcosms of the modern art continuum. Design House IDOLI is built from log and natural stone from Lapland. Within contains an exhibition, point of sale, and gourmet gallery which is complemented by eye-popping scenery from the HELMI glass teepee. We are located in the midst of the fascinating and peaceful wilderness, yet still easily accessible to Ivalo Airport, Inari, and Saariselkä.